Having developed a profound interest in the culture of hacking, the perplexed world of computer programming and information technology, New Zealand artist Simon Denny has taken over the Serpentine Sackler Gallery in order to convey these fascinations to the London audience. Entitled Products for Organising, the show spans the entire space of the Sackler Gallery, subdivided into two chapters with the artist’s voice that is heard throughout the exhibition space making humorous remarks in relation to the context of the show. Products for Formalised Organisations incorporate circular architectural models of three organizations’ headquarters: Zappos in Nevada, the new campus design plan of Apple in California, and the Government Communications Headquarters (GCHQ) in Cheltenham UK. Sitting on revostage platforms, the structures on view are fabricated with Plexiglas, UV prints and diagrams that involve the titles and front covers of business management best sellers, such as The Happy Manifesto by H. Stewart, The Ghost in the Machine by A. Koestler and Holacracy by B.J. Robertson. Products for Emergent Organisations occupies the left side of the gallery. 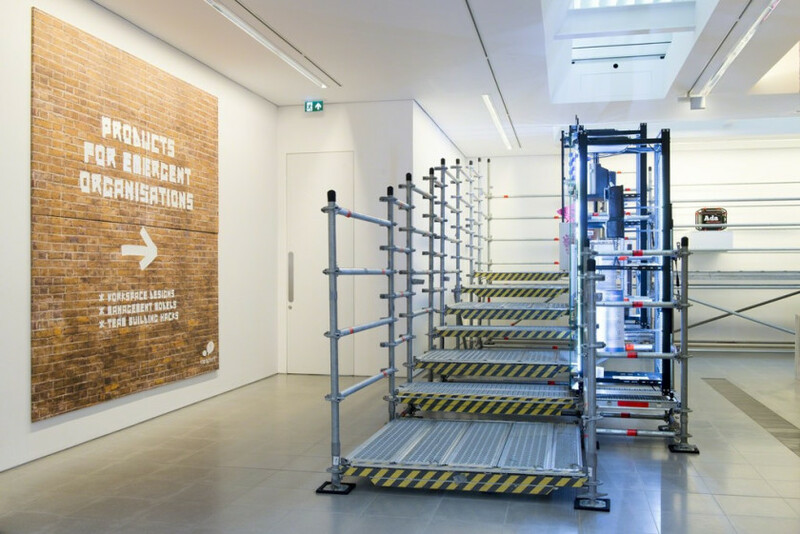 This presents climbable and non-climbable scaffolding that contain display units populated by a conglomeration of apparatus such as computer screens, wires, as well as a vast selection of other hardware. Artist and security researcher Matt Goerzen collaborated with Denny for this body of work. This chapter of work embraces the history of computing and hacking from the 1940s and 1950s to today, emphasizing events such as, the hackers’ legitimacy acts. A highlight of the exhibition is a late 1990s video playing on a small TV screen, narrating the case of hacker collective L0pht, turning into a ‘whitehat’ company to help push the US Senate towards the advancement of online security systems. His glass panelled vitrines emerge as data farms reminiscent of sci-fi film features such as the intelligence system of Skynet in Terminator, and plenty more. Denny’s undoubtedly painstaking research demonstrates his aptitude for the world of technology and its effects on the global population. The exhaustive use of corporate jargon and the sweeping references of business development techniques and management strategies (such as “agile” and “holacracy”, words appearing in Formalised Org Chart/Architectural Model: GCHQ 2 Agile, 2015 and Formalised Org Chart/Architectural Model: Holacracy, 2015 respectively) are lucid manifestations of a dominating corporate world. Denny’s ring-shaped structures emerge as concentrated building models initiating a micro-cityscape domain. Their presence is a commentary on the culture of his chosen organizations whose architecture reflects notions of the free circulation of ideas, the power of collective thinking and brainstorming as well as their advertised relaxed, yet state-of-the-art, working environment. Inscribing corporate jargon throughout their entire surface pronounces the distinctive characteristics and the very hypostasis of each of the three organizations, stemming from their carefully constructed corporate identity. This same fixation with neoliberal policies, cross-technological evolution and innovation was also the talk of Venice last summer. There, Denny’s Secret Power (2015) installation for the New Zealand Pavilion for the 56th Venice Biennale was split across two state buildings, the Marco Polo Airport and Biblioteca Nazionale Marciana. The installation was influenced by the recent NSA document leaks by Edward Snowden revealing top-secret information on US telecom surveillance programs. His Marcian Library installation showcased the same type of glass cabinets complete with hardware paraphernalia on revostage platforms juxtaposed against the grand interior of the Venetian Renaissance building. Denny’s visual vocabulary is somewhat puzzling and confounding, not easily accessible to many. The tech industry culture and the internet world are not the usual grounds for an artistic narrative. Dealing with such a fast paced discipline requires a sharp eye for detail, constant updating and a thirst for ongoing research. The work on display can be considered an archival, quasi documentary response to all the issues that Denny is so keenly interested in. Despite having an unquestionably educational character, his show needs a clearer artistic expression to stimulate viewers and engage them with a more art-orientated context. His practice may be considered by some as ground breaking, but one of contemporary art’s tasks should be to provoke further thinking and endorse an invigorating apt to further investigate and expand one’s horizons; not just the artist’s but the viewer’s too. Dr. Kostas Prapoglou is an archaeologist-architect, art writer, critic and curator based in London, UK and Athens, Greece. 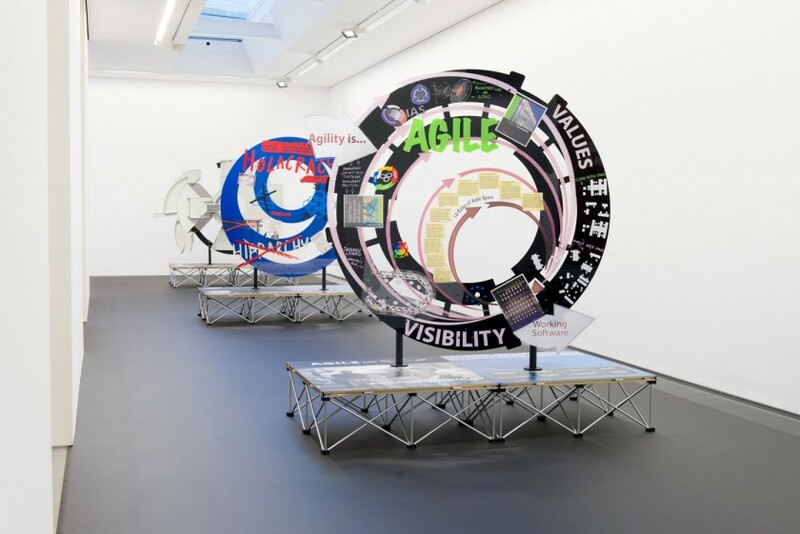 Simon Denny: Products for Organising at Serpentine Sackler Gallery runs through February 14, 2016. 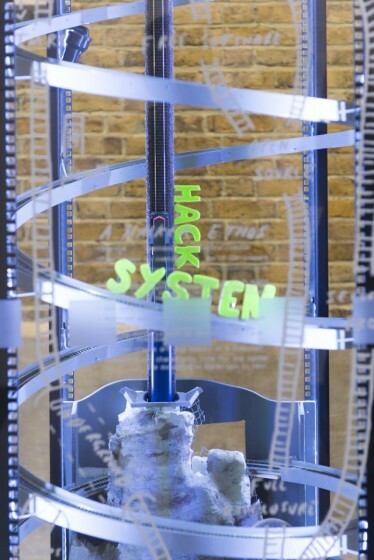 January 26, 2016 | Filed under Art Seen: International and tagged with culture of hacking, Kostas Prapoglou, Serpentine Sackler Gallery, Simon Denny, The Seen.